This is my wash kit: a standup ziplock ,that can withstand hot water, to use as a sink (weighs .40 ounce or 11 grams), half of a light terry wash cloth cut diagonally ( .65 ounce or 18 grams) and a .5 ounce (15 ml) bottle of Campsuds. Campsuds don’t come in that small of a bottle; I used an empty, tiny hand sanitizer gel bottle and filled it up. It’s nice to have a sink. After a day on the trail it’s wonderful to wash up with some hot water, a little bit of soap and a terry wash cloth. I only use the littlest amount of soap. I sometimes then use the water to wash out my underwear and hang it up to dry. It isn’t usually dry by morning, but because it’s synthetic it will dry on me while I hike. The sink can also be used for an ice pack when staying in town. My old sink was bigger; big enough to put a whole foot in. I wish I hadn’t lost it, because I can’t find another like it. I’m going to keep trying to find a bigger sink, It would be nice to have one that was big enough to at least stick a foot in; even better to be able to stick two feet in, so I could soak them both if needed. Some people cut the bottom out of a plastic milk jug to use as a sink. I’m thinking of cutting down a collapsible water jug and see how much that weighs. I certainly wouldn’t carry more then 2 oz. for a sink. 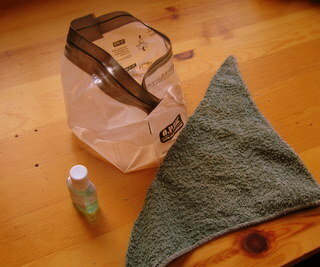 Note: Cut or make a button hole in the wash cloth so you can loop it to the outside of your pack to dry. It will be much more secure than tying it on. One more thing: Often I also carry a small scrub brush for cleaning feet, hands and gear. Next Next post: Backpacking first aid kit.